What if there was a doctrinally-based way to make every single day of your life significant, meaningful and amazing? Well, there is and it is so simple. I’ve only been doing this for a few days now and am still starting to get the hang of it, but I see the potential and I understand the doctrine. Have you ever started working out only to notice a few days later that your pants are fitting you better and your muscles are feeling more solid? That’s about where I’m at. 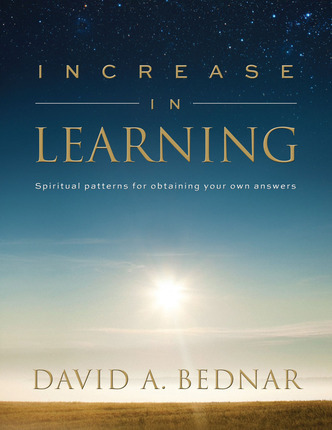 I’ve been really enjoying Elder Bednar’s book Increase in Learning. I’m somewhat embarrassed to admit it but this book, which was given to me as a gift from one of the wisest people I know, didn’t really impress me much at first. The title of the book really intrigued me and my expectations were pretty high since I really admire Elder Bednar. In the beginning, it didn’t really grab me and felt really “watered-down” and intended for a novice audience. I grew impatient and skimmed on through finding a couple nuggets and then shelved it about halfway through. Time went by and this same friend sent me a second book from Elder Bednar called Act in Doctrine. This one sounded promising but I didn’t get around to really reading it because I was in the middle of five other books at the time. A few months passed and as I plucked Act in Doctrine from my shelf and scanned it a little, some really interesting stuff jumped out at me and I felt like this was a book that I really needed to dig into at some point. However, I was swamped with work and shelved it after marking it up a little and collecting some nuggets of wisdom. Then things came full circle as my good friend and former Institute teacher and his wife came to stay at my home before heading out on a little vacation. It was like old times again as we sat down and feasted on the Word. As we shared what we have been learning with one another, he showed me his personal pattern of learning which consisted of five steps. The simplicity and truthfulness of it were instantly apparent and my paradigm was shifted. I pondered on it all that night and it was still on my mind the next morning. Then, I realized that I had read something similar in Act in Doctrine so I cracked it open and found what I was looking for. This particular section that had me so intrigued was referencing the fourth chapter of Increase in Learning that I so carelessly skipped over. I decided to give Increase in Learning another chance. My second time through the book, my mind and heart were more open and humble. Wow, does attitude make a difference! This is a fantastic book! I’ll tell you this much, the fourth chapter of Increase in Learning alone will change your life, I kid you not. So this brings me back around to the purpose of this article which is drawn from one little part of the “Related Readings” for chapter three. The first of the “Related Readings” for chapter three is called “Pray Always” (Ensign, November 2008, 41-44). 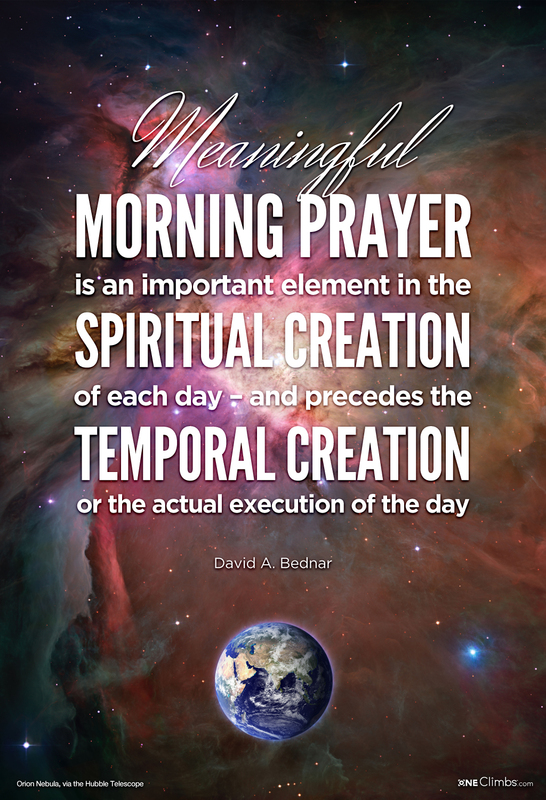 Elder Bednar mentions the creation of the earth and how it was created spiritually before it was created temporally (Moses 3:4-5). This doctrine is critical to understand as it relates to the next teaching. I have never made that connection before. Immediately my mind was flooded with possibilities and was filled with desire so I kept reading. What if I wake up each morning and spiritually create my entire day under the the direction and approval of God? What if I am warned against something that I planned to do or was instructed to do something that wasn’t even on my radar? What if I made the focus of my day the loving creation of each point of the plan into existence through the power of will and the grace of God? So here I am attempting to apply the principle of prayer according to the doctrines of creation, accountability, obedience, repentance and atonement. Thus far it feels like the first few days of going to the gym. I feel a little uncoordinated, weak and undisciplined but my pants are fitting better so to speak and I’m loving the endorphin kick! I’m excited to see how this changes my life and how it affects my relationship with God. I also noticed that the cover of Bednar’s book subtly references the order of Celestial symbols that is also found on many temples, particularly the Northern side of the Las Vegas Temple. Typically, there is also a moon between the Earth and Sun which may reference Jesus Christ, like on the Southern side of the Las Vegas Temple. I wonder if the moon was left out intentionally and if so, what potential meanings can be conveyed with just the earth, sun and stars in this order. Leaving the moon out brings the number of symbols from 4 to 3 and the number 3 is associated with themes such as divinity. This could be associated with theme of the book which is geared more toward divine learning rather than just worldly learning. There could be numerous other possibilities as well. After pondering Elder Bednar’s counsel and the doctrines it is based on, do you feel prompted to make any changes? Have you read Increase in Learning? Did you have a similar first impression or were you not as thick-headed as me? Do you implement principles similar to these already? How long have you been doing so and what insights would you be willing share? Great post. I took advantage of the 2-for-1 ebook special on these but haven’t read them yet. Thanks for giving me the final push. I’ll get to them as soon as I finish 21 Principles, also a very enlightening book. Great article. Love this concept of return and report. What was your friends 5 step pattern for learning? 1. Understand context and content. 2. Identify doctrine and principles. 3. Understand the doctrine and principles. 4. Feel the importance of the doctrine and principles by the power of the Holy Ghost. 5. Apply the doctrine to life. 1. Determine content & context. 2. Discover doctrines & principles. 3. Ponder to reveal personal applications. 4. Record what you receive.